When it comes to cooking at home, I’m a total creature of habit. I tend to make the same healthy things every week and when I was thinking about why, I came up with a number of reasons. 1) It makes going to the grocery store a breeze. I’m in and out, mostly because I’m picking up all of my usual things. (And I know where everything is!) 2) These recipes are SO EASY to make. I’m not sure if it’s me being lazy or simply preferring eating to be a breezy, enjoyable experience. Let’s go with the latter. 3) Kind of like how we’ve talked about uniforms and decision fatigue, cooking is kind of the same for me. It’s nice taking the guesswork out of it! 1. Baked Meatballs | I shared this recipe a while back and I was so, so thrilled to see how many of you made them and loved them! 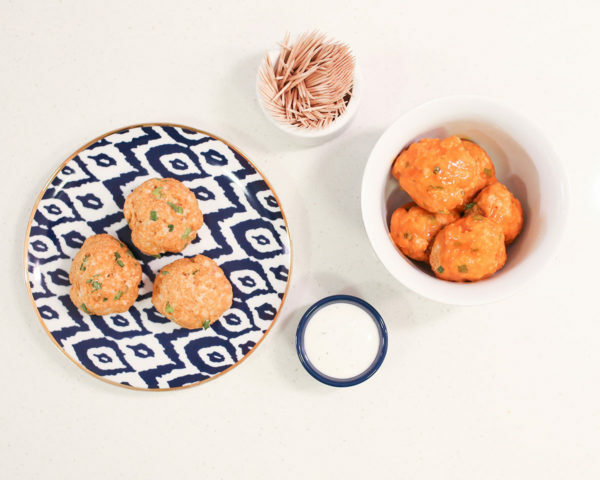 I make a batch of meatballs every week and add them to my typically veggie-based dinners for protein or even have one with lunch. I’ll typically cook brussels sprouts or broccoli (my two faves) and pair with the meatballs! 2. Zucchini Noodles | I’ve been making Merritt’s zucchini noodles for months and the recipe is great. I swap ingredients in and out all the time depending on what I’m in the mood for and what I have on hand. Sometimes I add ground beef or turkey, sometimes I swap the artichokes for mushrooms, sometimes I don’t add any parmesan… Just depends how my body is feeling! 3. 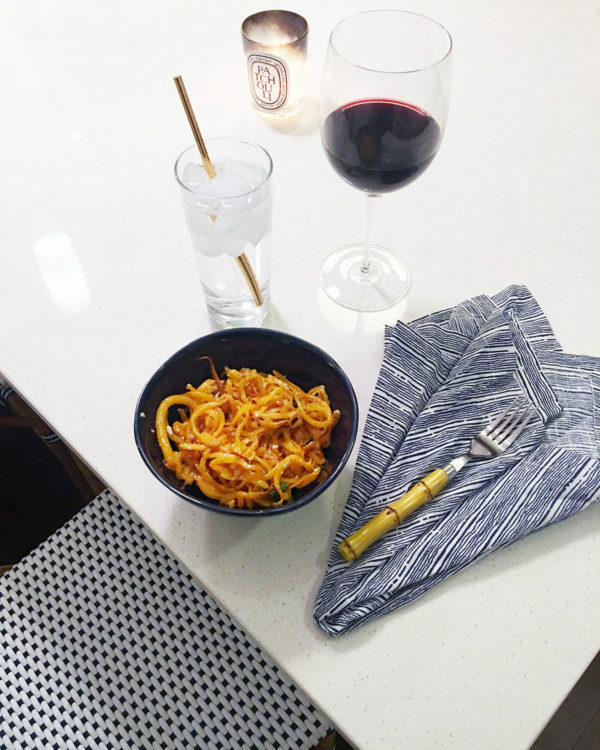 Butternut Squash Noodles | (Pictured in the first photo!) These are SO good! I put a little bit of butter (1 tbsp) in the pan when I’m cooking them and there’s a bit of cheese, so these always feel like more of a splurge. If I’m craving something creamy or dreaming of ordering pasta for dinner, this is usually what I make instead. They’re also great with ground Italian sausage added in! I don’t have a specific recipe for these (I typically just make things up as I go…), but I start with cooked cauliflower rice in a bowl (you can buy fresh or frozen at Whole Foods) and build it from there. Again, I base my ingredients on what I’m in the mood for and what I have on hand! I’ll sauté some bell peppers in a little bit of olive oil, heat up some black beans, slice an avocado, and top with salsa. Sometimes I’ll add lettuce or spinach if I want some extra crunch. You could definitely add a protein, too! As for tortillas, sometimes I go for the “bowl” route or I buy the Tumaro’s 60-calorie whole-wheat wraps. Of course, there are nights that I use cooking as more of a therapeutic hobby. I actually really do enjoy cooking and on those nights when I’ve got the time, I love trying out new recipes. Whether it’s a recipe I’ve found online or something I’ve ordered from a meal-delivery service, it’s nice to switch it up and take my time making a nice dinner. FYI: I use Plated whenever I do a delivery service… I love how all the ingredients come right to your door, but you still fully prepare them yourself! I started using the service back in 2014 or 2015 and I’ve always been happy with the quality (and great taste!) of the food, as well as the ease of the meals. I feel like I learn new cooking skills without getting frustrated or ruining the dinner! This is totally NOT sponsored, just sharing because I’ve always genuinely enjoyed using the service. Weigh in: What are some of your go-to recipes for weeknight dinners?! I’d love to add a few more to my repertoire. Thanks for sharing all these recipes! Obviously they are not only healthy but also very healthy! These all sounds like such yummy dishes! Thanks for sharing! Love all these options! I’m constantly on the lookout for more easy and efficient dinner options to rotate into our schedule! 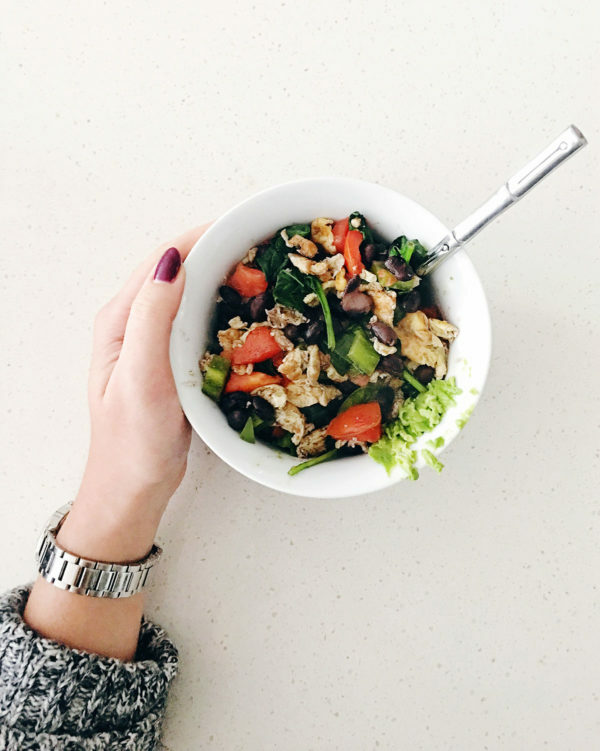 I’m currently making my way through a bunch of #meatlessMondays veggie dishes we featured on our blog (http://areweadultsyet.com/2018/01/01/resolve-make-meatless-meals/) as some New Year’s Resolution inspiration! All of these recipes sound so good! And those meatballs look delicious!! Thanks for the great post, I’m always looking for fresh, delicious, and SIMPLE recipes to make! Start with 3 or 4 Seapac shrimp scampi. Salute until they start melting and make a sauce, then add chopped red bell peppers, mushrooms, then lots of spinach. Meanwhile be cooking pasta or raviolis. When the spinach is wilted I stir in a little feta olive mix in herbed olive oil that I get in a serve yourself deli bar at the grocery store. Add the pasta and serve. I make it for one. Fast and easy. Great ideas! 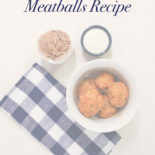 I especially love the idea of making meatballs. It’s so hard to find easy/healthy meals to cook for just two people. I just picked up some zucchini noodles to try for the first time! I’ve never been one for healthy eating. I grew up with very basic food since my dad can’t eat a lot of food or spices so I lived on potatoes, meat, broccoli and carrots for the first 10 or so years of life. I’m now trying to become more open to eating veggies and other healthy meals. Only problem is that I can’t cook at all – I have no instinct when it comes to it either – but the zucchini noodles sound like something I could try for sure! 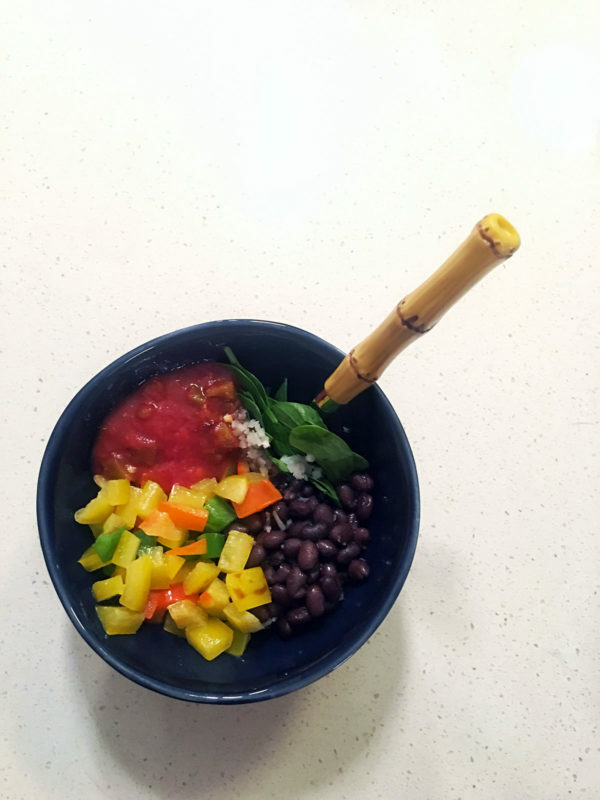 I love making burrito bowls or zoodles too! I also like to do ahi tuna poke bowls. I buy this really good frozen ahi tuna at the store and thaw it while I’m at work. I’ll usually use rice, carrots, cucumbers, green onions, avocado and then some chipotle aioli and soy sauce. Could totally be modified to be healthier. It comes together super quickly, though! Yum! 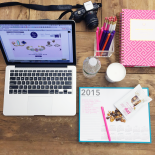 Stumbled across this post and now I’m basically 17 posts deep in great food and meal ideas. Must make your meatballs. Thanks, Jess!